Beccy and Ade had a very romantic elopement, with just the two of them enjoying the day together. Our brief - and we also had the honour of acting as witnesses! - was to capture the day in a relaxed way. 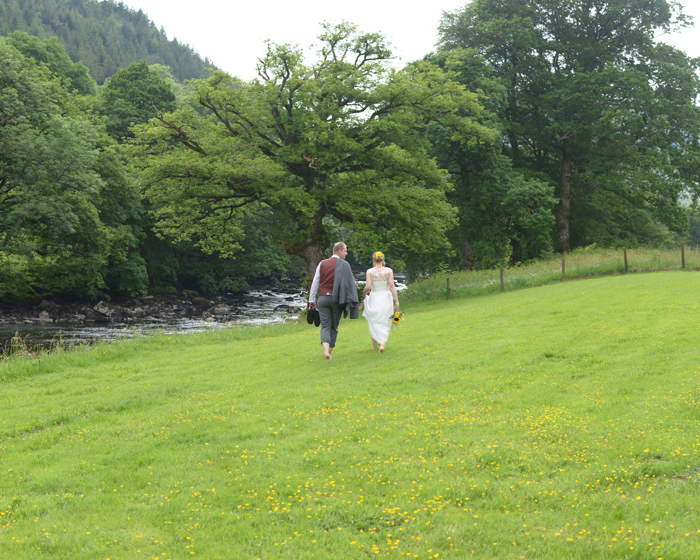 The wedding took place at the Craig-y-Dderwen hotel by the river, just outside Betws-y-Coed. It made a lovely location for a summery set of wedding photographs. We thought that the Craig-y-Dderwen hotel is a really nice venue for a relaxed wedding. The staff are very friendly and helpful, there are plenty of outside spaces and the place has a chilled ambience. The river rushing by adds a touch of drama too. What we liked about this wedding was its simplicity and the relaxed nature of the day. We loved the flowers chosen by Beccy, with the wonderful pops of yellow. The arrangements focused on informal summer flowers such as sunflowers and gerberas, which complimented the feel of the day very well. We're also loving the trend of grooms in waistcoats; we've photographed a lot of these this year and it really helps create an informal atmosphere - and the waistcoat alternative to a suit is particularly helpful when the sun comes out!